Brexit was the shot heard round the world. 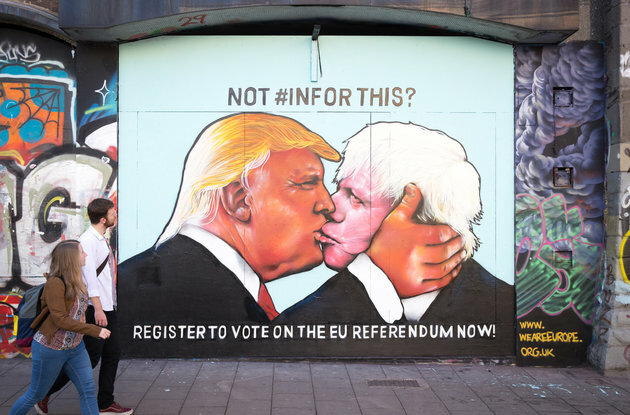 Donald Trump is the beginning of America’s Brexit. Why was Brexit—the move away from the European Union by the British—so meaningful? Because it returned the mechanisms of power to the people; to average Brits who had tasted the effects of handing over much of their sovereignty to a mass of unelected European bureaucrats, and found it antithetical to the proposition of individual freedom. America, more than any other nation, is founded on principles of self-government. In the absence of the ability to govern one’s self, there is no American form of democracy. It’s really that simple. The more diffused power becomes through layer upon layer of government, the less freedom the individual will have. The one is utterly incompatible with the other. That’s why states’ rights--better understood as the right of people in South Dakota or Florida—or people living in any other state in the U.S., to say how they will live, where they will send their kids to school, what they will eat, or when and where they choose to die, is essential to the idea of individual freedom. These are their choices, and not that of some non-elected government worker, inside the bowels of a massive federal bureaucracy. This, I would think, should be obvious to Americans. ​The promise of freedom from war and conflict that a one world government alledgedly offers, is the same offer made by kings and a ruling aristocracy for more than a thousand years. “Just make me king and I will bring peace to the world.” The founding fathers, having lived under such "divinely" inspired rule, understood just how big a lie this was. So, they rebelled, fighting a war to gain the freedom to govern themselves. ​Free trade, which is generally good for all people, can be used as a prime mechanism for the growth of the super state, increasingly controlled by unelected officials who make the same claims for peace and prosperity that divine kings have always made to their subjects. They do this under the guise of fairness and the need for sufficient power to enact a single set of rules, which will govern all people the same. Meaning, people living in Utah, will live under the same gun control laws that govern Chicago, for example. The one is a hellhole of crime and mass killings—and, the other, a relatively peaceful, hospitable environment. Not surprisingly, it is precisely the one with the greatest federal control that is virtually unlivable, with one exception, that being the wealthy. Now, imagine rules that govern China, Nicaragua and Utah, as though they were all alike. This requires a super bureaucracy. What control will the average person have then? The response by some, is that this is already true, so what difference does it make? In other words, we don’t really have much control anyway, so why not surrender even more control over our lives to the government. It should be obvious that this as oxymoronic a proposition as one can imagine. This is a prime reason why Donald Trump is hated and feared by so many powerful people. Apparently, even George Bush and family plan to vote for Hillary—and, make no mistake, this is a major factor. It was Bush senior who publically advocated a New World Order some thirty years ago. Let me stress, I am not anti-free trade. I am anti trade that automatically sees bigger, as better, without regard for the effect that individual trade deals have on average Americans. Which, may include new regulations and the growth of a new super bureaucracy to manage it all. That was the problem with Brexit. It appears to be the same with the new TTP trade deal that Obama is pushing so hard for, along with much republican support. In that way Obama and Hillary represent the status quo. It’s also why global power brokers could care less about the particular policies of an Obama or Bush, as long as they keep hands off the real source of power and money. Any other policies, whether they be a growing welfare state or a massive military buildup, are secondary considerations. All of the above, in the end, are money makers for the rich and powerful, regardless. The crumbs that fall of the table, those are the intended rewards for the rest of us.